Smart, energetic, and loving little parrots, jenday conures make good pets for owners who are able to spend time socializing with them. They're nearly as popular as sun conures and are suitable for families with children. If you're looking for a big bird personality in a compact size, this colorful and friendly species may be a good fit. The jenday conure is native to the woodlands of northeastern Brazil. They are generally seen in small flocks of 30 or so birds, which can become quite loud as they enjoy calling out during flight. The jenday conure is one of the smaller members of the parrot family. Adults typically grow to lengths of about 12 inches from the beak to the ends of the tailfeathers. This species can live more than 30 years in a healthy environment and when fed a well-balanced diet. Colorful and intelligent, these birds have been popular in the pet trade for many years. The jenday conure is naturally playful and affectionate, making it especially suited for companionship. While some birds can become attached to a single person, many will do well with a family unit and accept everyone as members of their flock. Jendays can be very cuddly, often enjoying a ride on their person's shoulder or inside their shirt. You will also find that they generally love to be petted and will bow their head when it's time for some affection. Most people admire this bird's beauty and charming personalities right from the start. It is important to note that jenday conures are very social birds that thrive on interaction. They may not be the best choice for those who have little time to spend with a pet. Many conures become screamers if they feel neglected, and some resort to destructive behavior if left unstimulated. 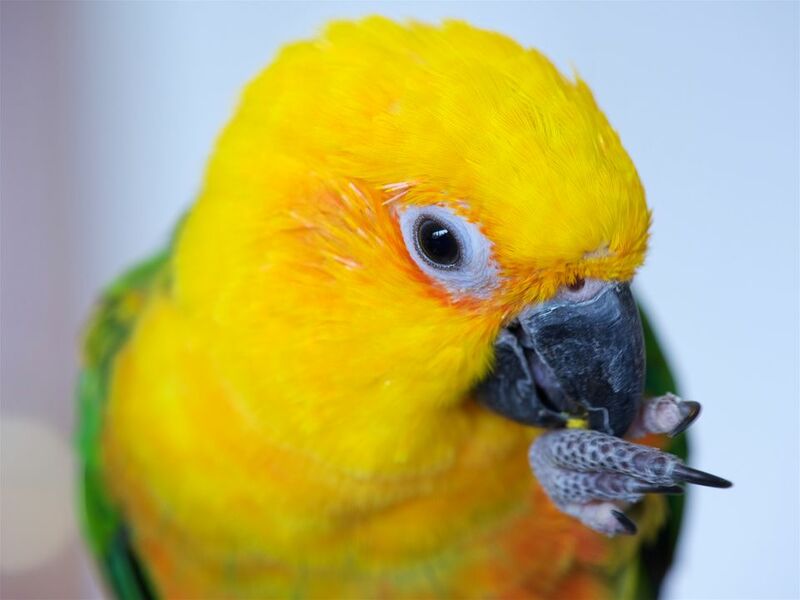 With a little love, proper training, and socialization, however, jenday conures make loyal companions. These birds have many colors in their plumage. The colors include a red-orange body with green wings and back. Their tail has blue feathers and their wings are rimmed with an iridescent blue as well. As their secondary name suggests, they have a yellow head with orange patches on the face. Jendays' beaks are black and their feet and legs are gray. It's a monomorphic species, so DNA or surgical sexing are the only true ways to tell males from females. However, females will have light brown irises and a grayish eye ring while males have darker brown irises and a white eye ring. Overall, jenday conures are very similar in size and appearance to sun conures. The easiest way to tell one from another is that the jenday has green wings while the sun's are primarily yellow. To keep their birds happy and calm, jenday owners must plan to spend plenty of time with their birds. It's important that the bird doesn't get bored, which can lead to destructive chewing and other behavior. Jenday conures are as intelligent as other members of the parrot family and can be trained to do simple tricks. While they can mimic human speech like larger parrots, most jendays don't typically "speak." That doesn't mean they're not entertaining, though. Many pet jendays learn to repeat common household noises such as telephones and microwaves. Though this is a small bird and would seemingly fit inside a cockatiel cage, it needs much more room than that. It should be at least big enough for the bird to flap his wings and move around freely, though the ability to fly a bit is better. They're extremely active and known to get cranky in small spaces. The absolute minimum space should be 3 feet long and 2 feet wide and tall. Bigger is better, especially if you choose to keep a pair. Jenday conure pairs do well in a home and generally keep their affectionate, well-trained pet characteristics if both birds are given proper attention. They can also be housed with another conure, particularly sun, gold-capped, and blue-crowned conures if you would like a pair of two species. In this scenario, it's advised to not let the birds breed. Some people have and, with a sun conure, the result is a hybrid known as the Sunday conure. Before you adopt a jenday, check with your local wildlife and game authorities about any legal restrictions on this species. Some areas require a permit to keep them while others may ban them outright. While it is important to ensure that pet birds get plenty of variety in their diets, responsible owners must also make sure that certain nutritional requirements are met. In the wild, jenday conures primarily feast on fruit, nuts, and seeds. In captivity, they need a balanced, pelleted diet supplemented with nuts, seeds and fresh fruit and vegetables. Make sure their food and cage are thoroughly washed to prevent transmission of parasitic infections. Also, conures are so active that obesity is typically not as big of an issue as it is with other pet parrots. Like other conures, jendays need adequate space to fly, explore, and play. Allow your bird a minimum of two hours outside of his cage each day. The birds will learn to hang out on a play stand adorned with ropes, toys, and other interesting bird-safe trinkets. Be sure the out-of-cage time is in an area free of hazards (and cats), where your bird won't be able to fly out of the house accidentally. Inside the cage, set your bird up with lots of fun activities. A swing is a must as these little parrots will quickly make it their home roost. Ladders, bells, and ropes will also provide a jungle gym experience. Don't forget the chew toys, either! They are voracious chewers, just like all conures, and it's best that they exercise their beaks on acceptable things rather than the cage or your furniture. Wood toys and branches swapped out regularly should keep the bird engaged. Otherwise, check out all of our other small parrot species profiles.